AUSTIN, Texas — Consider senior standout Texas defensive end Charles Omenihu as the poster boy for the Longhorns’ frustrations after a 24-21 overtime loss in Kansas two years ago — not for the way he played but for his actions after the game, a helmet-throwing tirade that went viral but has now been removed from the internet. 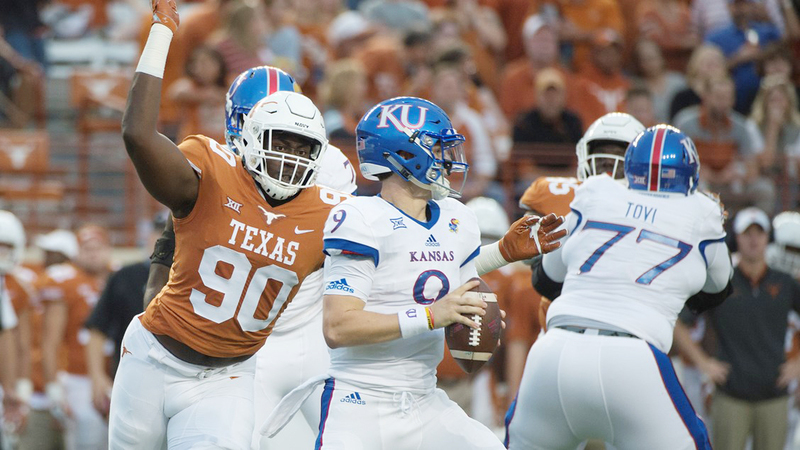 Expect Omenihu and his teammates to be at their best Friday when the Longhorns play in Lawrence for the first time since that late-season debacle in 2016. While the last trip to Kansas had plenty of significance to Texas — the loss likely cost coach Charlie Strong his job on the 40 Acres — this time it is even more important: a win will grant the Longhorns a spot opposite either Oklahoma or West Virginia in the Big 12 Championship game. Omenihu has called that UT loss at Kansas two years ago the lowest moment of his football career. “By far,” Omenihu reiterated Saturday after the Longhorns, then ranked 15th, beat No. 16 Iowa State to put themselves in the position for the league title. “I hate losing, and losing the way we did that day in Kansas hurt us all really bad,” Omenihu said. “Our focus is all about taking each game as they come, going 1-0 each week, but winning in Kansas and earning a trip to the (Big 12) championship game on that field would be special to me and all my other teammates who were there two years ago. Omenihu got an NFL draft evaluation after last season and wasn’t happy with what was predicted, and decided instead to return for his senior year at the 40 Acres because he had unfinished business. Over the offseason he shed about three percent of his body fat, dropped five pounds to a ripped 275 pounds and increased every one of his measurables. He has lived in the opponents' backfield, racking up 12.5 tackles for loss (good enough for fifth in the Big 12) and 7.5 sacks (tied for third in the league). In eight conference games, Omenihu has 11.5 TFL (third) and 6.5 sacks (tied for second). Omenihu knows how to utilize his length, often extending his long arms into blockers while using his weight to keep offensive linemen at bay and get around the corner. In last week’s win over Iowa State, Omenihu scooped up a fumble after a quarterback sack. When Texas coach Tom Herman was asked Monday which of his players have come the farthest this season, he pointed out Omenihu for his constant effort. “Charles’ game has steadily improved over the course of the year,” Herman said. Playing football can be as demanding mentally as it is physically, and Omenihu said he understands the need to balance the two, spending the extra time in the film room to try to determine opponents’ tendencies. If the Longhorns beat Kansas, as expected, that mental preparation will be a big part of the success. A little bit of a revenge factor will be in the mix as well, and Omenihu has some payback to inflict.